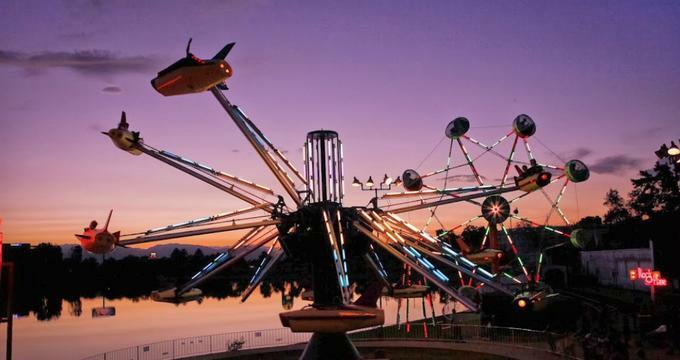 Lakeside Amusement Park in Denver, Colorado is located on the shores of Lake Rhoda, in Denver’s Lakeside neighborhood. The historic park has been open each summer for over 100 years, since 1908, and is a family favorite. Attractions at the park include a merry go round, bumper cars, trains and several spinning rides, including every historic Eyerly “O-ride” such as the Loop-O-Plane, Rock-O-Plane and Roll-O-Plane. The miniature Orient Express features ‘Puffing Billy’ and ‘Whistling Tom,’ two steam engines original to the 1904 St. Louis World’s Fair. The park’s original 1908 carousel was built of even older animals repurposed from other carousel rides. Thrill seekers will enjoy the drop tower and the 1940’s Cyclone wooden roller coaster. Two additional coasters include Wild Chipmunk, added in 1955, and the Dragon, added in 1986. Younger children can play at the Kiddies’ Playland, where rides include Flying Tigers, the Frog Hopper, and Midge-O-Racers. Visitors interested in the park’s more than 100-year old lineage will find many examples of salvaged Denver history throughout the park. The pool used for today’s Skoota Boats ride is the original Shoot the Chute pool. One of the picnic pavilions is structured around a center column from an original ride, and in the main restaurant, the marble bar and mirrored back bar were salvaged from Denver’s Union Station, a turn-of-the-century building which was remodeled in 2012. A telephone switchboard is still in use at the park’s main office. Tower of Jewels is the park’s centerpiece. The 150-foot tall tower was once among the tallest buildings in Colorado, and is decorated with over 5,000 lights. The Tower of Jewels was originally topped by the spotlight from the Ferris wheel at the 1904 World’s Fair. Built as the park’s casino and theater, the Tower of Jewels hosted concerts, dances and plays. The building is now used as park offices and for storage. Guests pay a gate admission and then choose a pay-per-ride model, or they may pay for unlimited rides. History: The family-owned park opened in 1908 under the name, White City, a reference to the more than 100,000 glittering lights throughout the park, and the architectural style in which it was built. White City was once a common name for amusement parks in America, Great Britain and Australia. White City parks were built in the style of 1893’s World Columbian Exposition, better known as the Chicago World’s Fair. With the build of Coney Island’s Luna Park in 1901, White City style amusement parks sprung up all across the United States, and continued to grow in popularity through the 1920’s. Each White City amusement park included a ‘Shoot the Chute,’ the precursor to today’s log flume rides, a Ferris wheel, roller coaster, collection of carnival games, miniature trains and picnic pavilions. Denver’s Lakeside Amusement Park is the only of the original White City parks to survive today. The park is the oldest in Colorado, and one of the oldest in the United States of America. Adolph Zang, the son of a prominent Denver brewer, was the force behind the idea for the park. A member of the Lakeside Realty & Amusement Company, Zang spearheaded the park’s creation in the early 1900’s. Zang was famously involved in a lawsuit just a few years later accusing the park of selling liquor on Sundays. Zang sold his stake in the Park just prior to Colorado’s enactment of prohibition in 1916, believing the park would not be an earner without alcohol sales. In the 1930’s Ben Krasner purchased Lakeside Amusement Park and made several improvements, rebuilding many of the park’s attractions in an Art Deco style and adding several neon elements. Ongoing Programs and Education: Groups have enjoyed the park since 1908 for birthday parties, picnics and family outings. Groups may purchase discounted unlimited ride coupons in advance, and although outside caterers are not allowed, Lakeside provides a variety of menu options for group dining. Menus include one-sandwich lunches, hot-dog or hamburger options. Three different types of smoked and grilled meats include Texas BBQ, KC BBQ, Milwaukee BBQ or a BBQ chicken platter. Groups may rent one of the outdoor pavilions for exclusive use while dining. Each summer, the park chooses three Fridays during which adult rides open early so summer camps, daycare programs and children’s groups can ride before adults have access to the park. Park admission is reduced those days for all children’s groups.